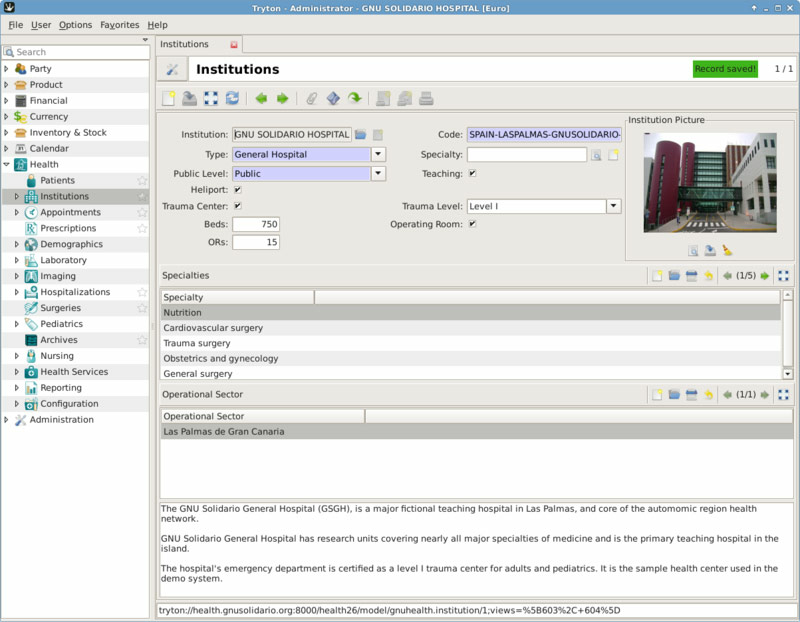 GNU Health is intended for health institutions to take care of the daily clinical practice and manage resources. 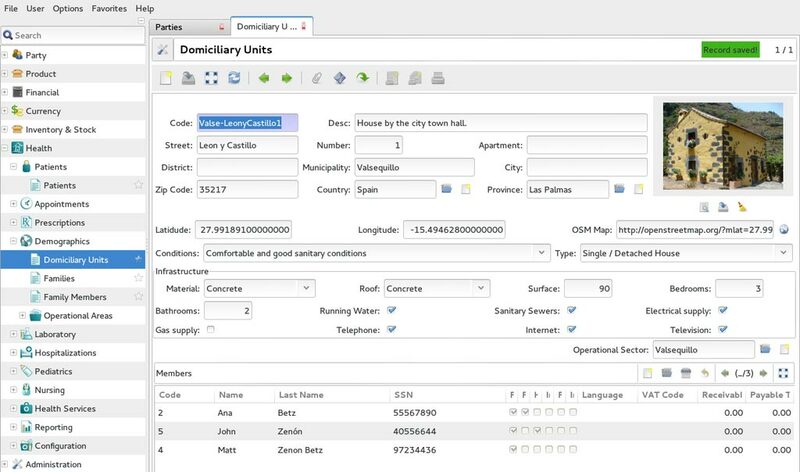 GNU Health uses a modular approach with different functionalities that can be included to meet a health center's needs. It uses Free/Libre, state-of-the-art technology to deliver Freedom and Equity in Healthcare. 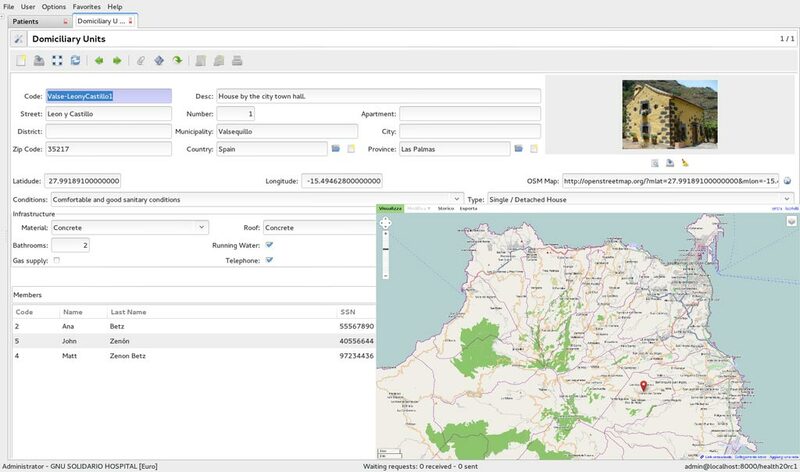 GNU Health is a Health and Hospital Information System deployed in many countries around the globe. GNU Health combines Social Medicine and Primary health care principles with state of the art advances in bioinformatics and precision medicine, delivering a valuable framework for governments and Public Health institutions, as well as for academic and research organizations. 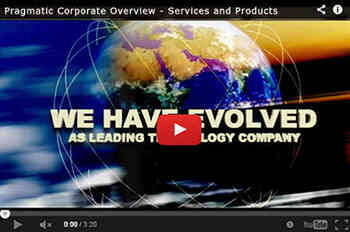 The very first health institution that you create is special because it is also your company. Our health is much more than just cold medical records. Most of the time, our health is the result of many events related to the environment, decisions we make, and interactions with many actors, that shape our life as individuals. 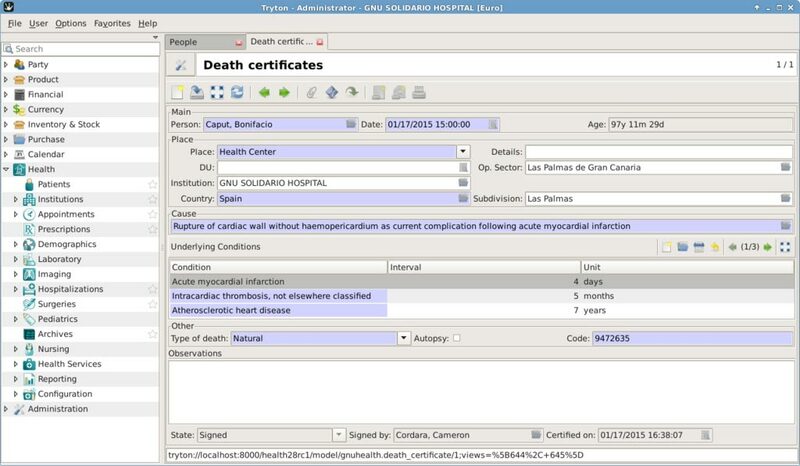 GNU Health has developed a way to record the relevant events on a person life. These events are not just medical, but also demographical, biographical and social. Each of those relevant events make a Page of Life of the individual. 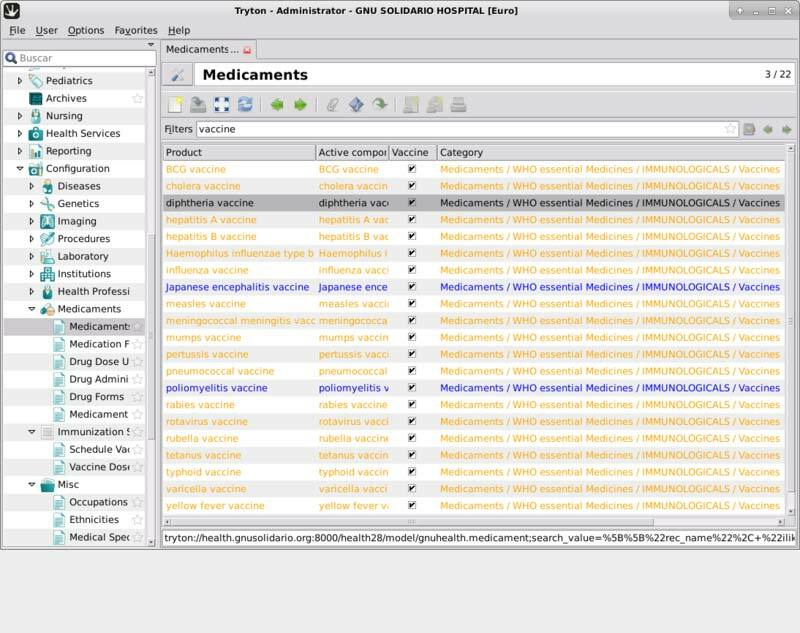 Integration with GNU Health HMIS node: From the Hospital Management System Node (HMIS) of GNU Health, processes such as encounters, prescriptions, lab and diagnostic imaging are mapped to the book of life of the person. In addition, the page of life allows the person to be in charge of their health information. The person will be able to read and post relevant information to be part of their Book of Life. 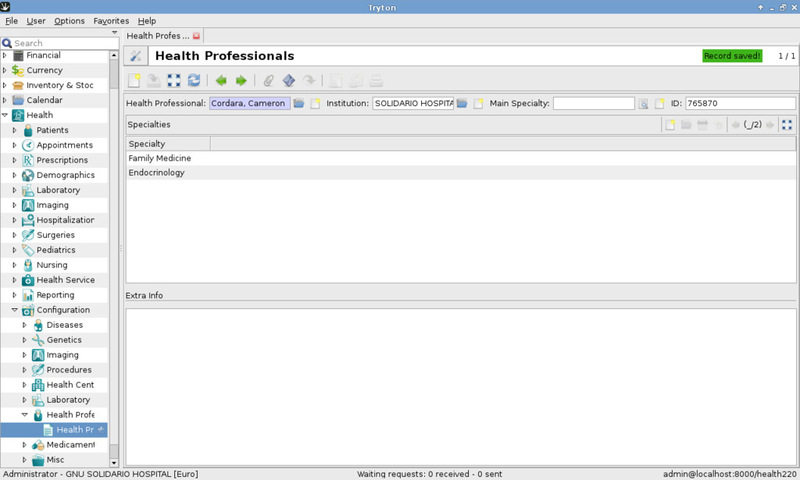 Prescriptions can be found in the Health → Prescriptions section of GNU Health. However, since in most cases you only need to see the prescriptions of a specific patient, the recommended way is to open a Patient record and to switch to Prescriptions using the Relate button. Prescription records can be tracked and inventoried by means of stock management. To quickly create a new stock move, right-click the prescription > Actions > Create Prescription Stock Move. 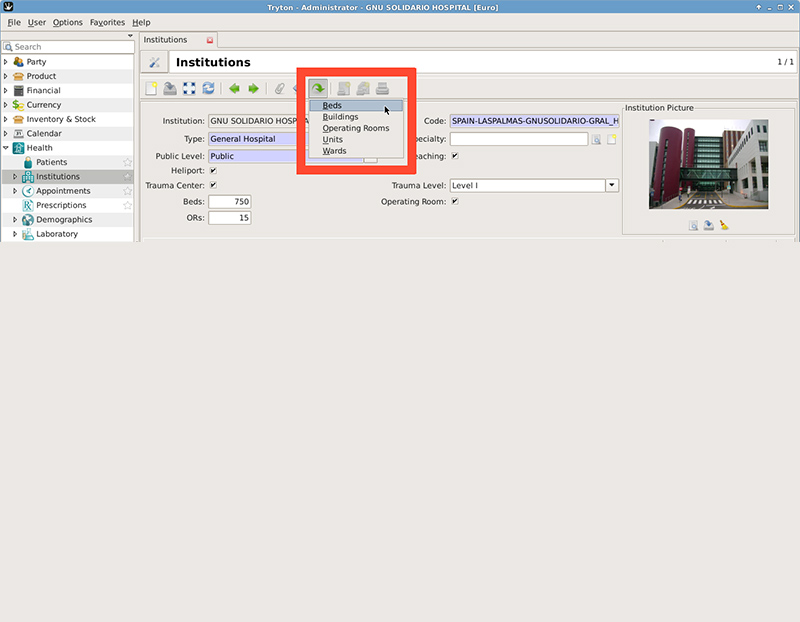 To view previous stock moves, right click the prescription > Relate > Stock Moves [readonly]. The death certificate is a key document, since it has legal, administrative, demographic and epidemiological significance. Death certificates work very much the same way like birth certificates, but they store more information about causes and circumstances of death. The best way to access a person death certificate is by using the related action from the Party model (refer to the birth certificate section). Alternatively, the can be accessed via Health → Demographics → Birth certificates section. 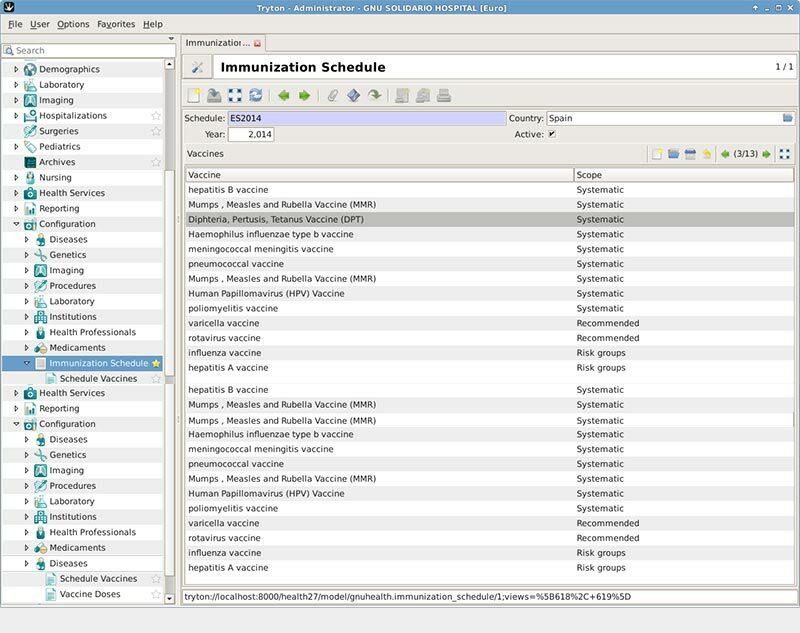 GNU Health includes immunization functionality in the core module. This includes immunization schedules per country and year, the vaccination process, and the person immunization history and status report, to name the main aspects. In GNU Health, vaccines are part of the medicament model, those that have set the vaccine attribute. GNU Health includes as default the vaccines that are part of the WHO essential list of medicines module, but you can set up your own set. Health → Configuration → Immunization Schedule. 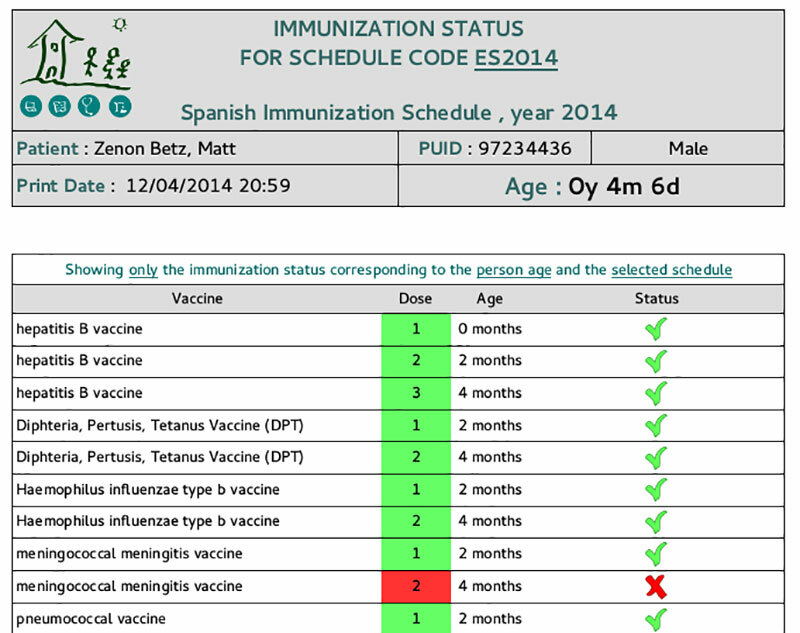 After you have the list of vaccines, you can create different immunization schedules. The following patient shortcut will take you both to the vaccination history and to the vaccination process itself. Health → Patient → (relate action) Vaccinations. We can check the Patient immunization status by executing the following report: Health → Patient → (report) Immunization Status Report.